Since I experimented with this mouth-watering, spicy mango curry recipe, mangoes have had a hard time to survive in our fruit basket for more than one day. Not only that this exotic fruit is plain just a wonderful snack, in the meantime I just know too many clean eating recipes where mango is also the perfect ingredient. Where to buy affordable mangos? For this recipe you could also use convenient, frozen mangoes which in my region I can also get at the discounter. Let me know in the comment section if these juicy exotic fruits are affordable in your region too? If yes, where do you buy them? 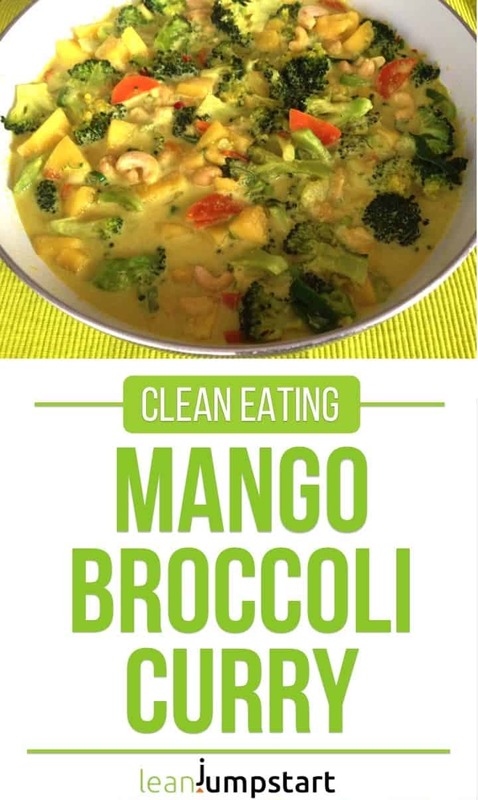 When looking at the photos, don’t you think that this yellow dominating mango curry could make a perfect, vegan Easter dish? Easter is a feast of joy created by nature. We are surrounded by yellow flowers such as daffodils and dandelions. We also eat yellow dishes such as Easter pancake, Easter eggs, polenta, and curry. This has an effect on our state of mind, because yellow is considered to be the real mood booster among colors. A yellow tablecloth and yellow napkins and/or a bouquet of yellow Easter bells or tulips on the table are the perfect requisites to spend happy hours with family or friends. Easter is three weeks away. So there is still enough time left to test out this simple and creamy mango recipe in time. for about two minutes until the garlic is slightly browned and you can taste the smell of the chilli peppers. Then use the vegetable stock and coconut milk to deglaze. Add broccoli and carrots and bring to a boil. After boiling, add the spices and simmer on a low heat for about 15 minutes until broccoli and carrots are almost cooked. Add onions, mango, and cashew nuts, stir well and simmer for another five minutes. Serve with or without a side dish, e. g. nutty brown, wild rice or quinoa. To keep you in shape and healthy, it is advisable to include more fiber-rich foods in your daily diet. Thanks to the fiber in broccoli combined with brown or wild rice and cashews you can easily create a nutrient-dense meal high in roughage. Such a meal can prevent constipation, aids in digestion, and helps manage cholesterol levels. 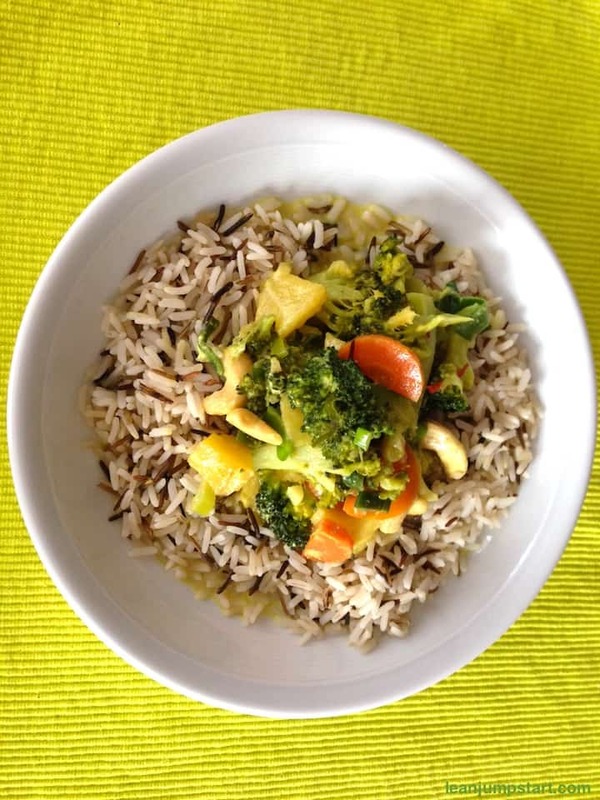 It is easy to vary this soy free recipe regarding vegetables and also meat. 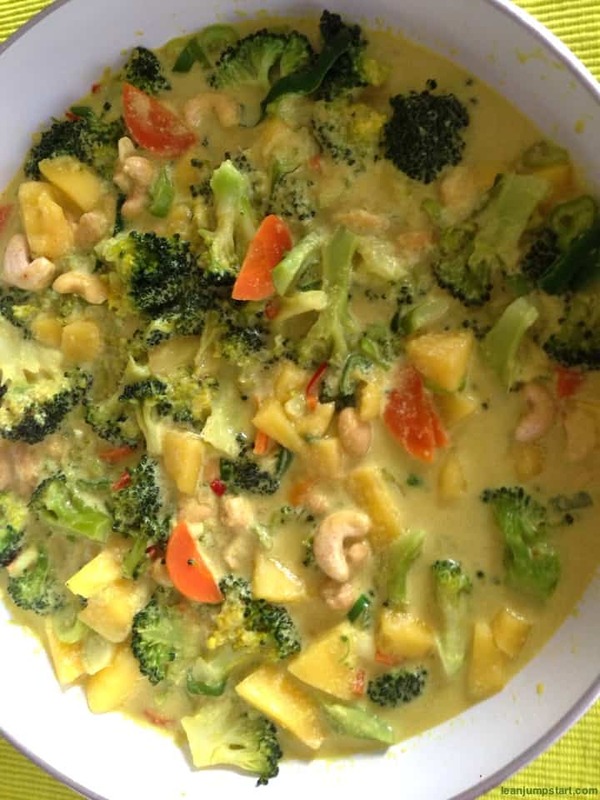 If you have omnivore guests for Easter, then you could easily add some chicken breast stripes or shrimps to this tasty curry recipe with steamed rice. Especially chicken and mango are a perfect match. include it in my beloved mango salad recipe with cucumbers.